How are people getting such high scores as 9x10^18 in Temple Run? I see daily high scores in the billions and the all time high scores are ridiculously high, how are people getting these scores? What is more than likely happening is that these users are hacking these scores. A quick Google search will reveal software that you can obtain by jailbreaking your iOS device, allowing you to hack whatever score you wish to send to the Game Center leaderboards. If you look at the All-Time High Scores for Temple Run, the highest score you will see is 9,223,372,036,854,775,807 or 2^63 - 1, which just so happens to be the largest signed integer that can be stored within 64 bits of data (see this Wikipedia article). 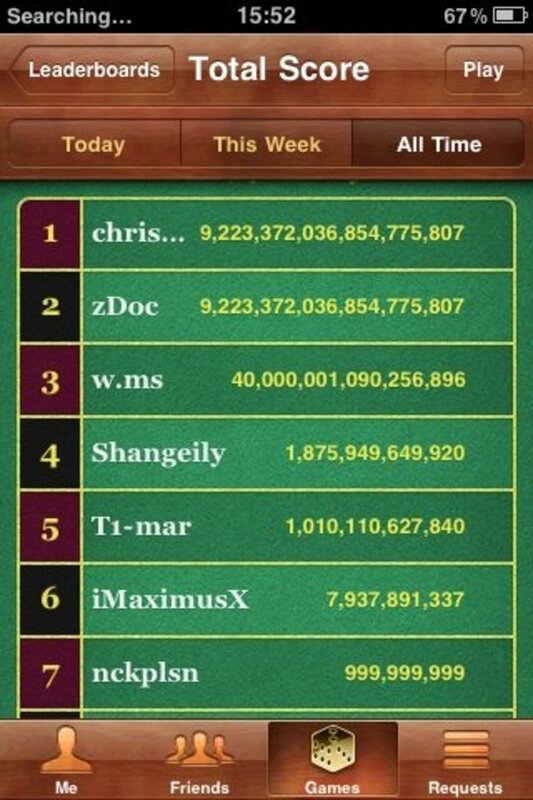 These users likely tried to fake the highest score they could, but the leaderboard cannot store any value higher than the one shown above. As fireDude67 points out, there is a glitch in the game that causes the path to be continuously straight and free of obstacles. On the first turn, swiftly perform the gesture to turn, twice; practically simultaneously (see demonstration). The character will now run forever, until you trip twice and cause the apes to eat you. There don't appear to be any coins or bonuses after glitching, so by my rough calculations I estimate that you'll earn about 500 points per second. So to get a billion points, it would take about 23 days. The all-time high score (and possibly maximum score as it is tied five ways) of 9,223,372,036,854,775,807 would take nearly 600 million years. So maybe there's a way to glitch a coined path, or maybe that number is somehow significant in computing. The mystery remains. If anyone tried this you would have found that when you successfully preformed this, after a few seconds it starts to thunder and lightning. After straight running for a while it resets to the normal game play and after you get eaten or you miss a jump it says "YOU ATTEMPTED THE GLITCH you tried to cheat :-)". It gives you one of those achievement things so the creators of Temple Run must have seen or heard of "THE GLITCH". This only works on the latest iOS update. Not the answer you're looking for? Browse other questions tagged temple-run or ask your own question. How can you jump farther in Temple Run? How do multipliers work in Temple Run? How do I use utilities in Temple Run? How can I increase my Temple Run multiplier? Do the different characters in Temple Run affect gameplay? In what order should I upgrade my stuff in Temple Run? Should I always turn the same direction in Temple Run? How does distance measurement work in Temple Run? Pros and cons of periodically running yourself into wall in Temple Run? Is there any pattern for artifacts in temple run?